With the ambition set to make Ydigital Asia a leading consulting and digital marketing company, we collect actionable feedback from our team in various ways to see how we can improve. One way is our bi-annual Employee Happiness survey, which tells us directly how engaged our team is. 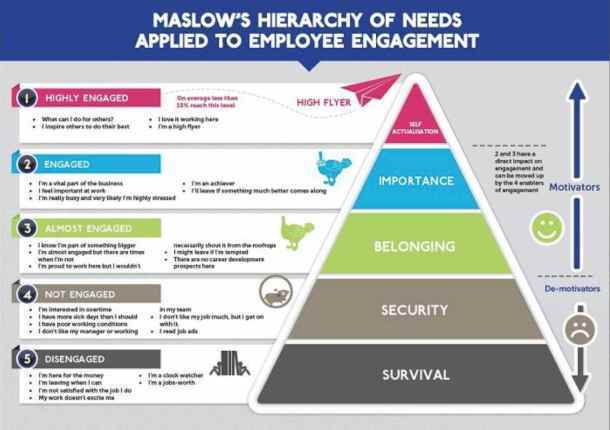 We work with five levels on employee engagement and while we understand everyone can’t be 100% happy, it’s our goal to always improve. Realizing that only few will reach level 1, it’s our focus to get as many as possible to level 2. Before diving into our 2017 Q2 results, here’s some context about Ydigital Asia. The survey does not include founders and top management as it would skew the score. Around 85% of our remaining team took our survey. The numbers below are excerpts from our full survey and combines our leadership and employee happiness surveys. A 2013 AON Hewitt study showed that 60% of employees globally are engaged and 40% are passively or actively disengaged – the numbers are slightly worse for Asian companies. Ydigital Asia has a clear purpose that 94% of our team understand. It was a focus point for us to clarify this in Q1 and Q2 and we see the results now. 70% also understand how we will get there. This leaves room for improvement. Being at the forefront of digital transformation and marketing, our clients’ business change rapidly which forces us to constantly adapt and test new technologies and ways of working. Constant change requires a lot from our leaders and teams and we invest in leadership training to make sure our team sees change as a positive aspect of work. One of our company values is “learning”. Without learning and feeling rewarded, employee churn will sky-rocket with digital talent being a scarce resource in Indonesia. We currently focus on designing the right systems to ensure everyone learns and top performance is recognized. Overall, we are satisfied with our numbers in learning and rewards. Career path needs to be better explained. Around half the replies show that we need to be better at career planning which has been initiated. Career planning is a challenge in the digital industry where new technologies call for new skill sets and new titles emerge every year. Career planning will not be all linear and it also depends on how quickly individuals develop their skills. One thing is for sure; we are up to the challenge and Ydigital stays committed to always having a company where employees perform, feel rewarded and love going to work. That’s how our clients grow, it’s how we grow and how individuals grow. The time is now: Are you ready to boost your customer relationships? Chatbots - hot air or the next big thing? Share your vision, dreams and challenges - we may be the right partner for you. © Copyright 2019 - Ydigital Asia. All Rights Reserved.